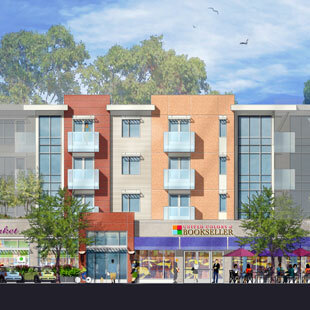 For more than 40 years, Oaktree Development, LLC, and its predecessor Unihab, has specialized in the design and development of innovative, multi-family, mixed-use, mixed-income, high performance and transit-oriented (TOD) projects. Founded by award-winning architect-developers, Arthur Klipfel and Gwen Noyes, Oaktree and its partners have successfully developed and/or designed dozens of projects consisting of 2000+ residential units and commercial space. These developments include amenities, materials and often ground floor commercial uses that contribute to the community's social and economic sustainability. In addition to its development and investment role, Oaktree provides development management services to external clients. Through the years the vision has stayed the same but evolved to include the latest technologies and materials. A commitment to sustainability has been a core principle for Oaktree since its inception. Oaktree’s dedication to innovation, creativity and financial performance is embodied by its companion firm, GreenStaxx. GreenStaxx is the patented building system created by Oaktree's founder, Arthur Klipfel. In the process of developing and designing urban residential units, it became clear that the same designs were used over and over in multiple projects. Thus the idea arose to create a system of replicable digital unit stacks that fit into a site-specific grid, that are cost-effectively and sustainably designed, and that can be fabricated off-site. This system has been used in multiple projects and can accommodate virtually any site. GreenStaxx (GSX) is a technology company focused on applying the principles of mass production, standardization and repetition to the modular design build process. GSX provides a patented system based on a digital library of pre-designed and pre-engineered unit stacks that can be assembled like Lego blocks to create the residential portion of a specific building. A key feature of our Solution is the deep integration of our unit plans with the production processes of our off-site fabrication partners. By using the GSX solution developers can deliver buildings faster, with reduced cost, higher quality and lower risk. 2014 – Finalist for ULI’s prestigious Jack Kemp Award for Excellence in Affordable and Workforce Housing for 30 Haven Street in Reading, MA, a 53-unit, 22,000 SF retail mixed-use development. In 2016, Oaktree was honored with the Multifamily Executive (MFE) Project of the Year award in the Low-Rise category for its 74-unit, 38,000 SF commercial development, Brookside Square in West Concord, MA. Several of Oaktree’s projects have been high performance and sustainability market leaders including Lexington Place, the first LEED Silver certified mixed-use development in the United States. Should you have any questions about Oaktree Development, its partners, or any of the projects please feel free to contact us directly.